We’re havin’ a party and everybody’s invited! Turning seventy-five may inspire some people to gold-plate their Senior Citizen cards, but we here at King County Parks aren’t slowing down one bit! 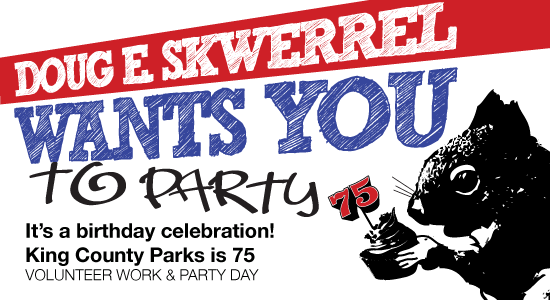 Instead, we’re throwing a bash, Parks-style, with trees, trails, and treats! Join us as we celebrate 75 years of parks, trails, open space and general awesometicity with a big she-bang on July 20 at Tolt-MacDonald Park in Carnation. In the morning, we’ll be showing our love to Mother Earth, with some habitat restoration and trail work. In the afternoon, we’ve got family-friendly games, contests, prizes, and even some special 75th anniversary treats. Grab your family, friends, and co-workers and come to our “Work & Party” Day on July 20th! Workplaces, community organizations, and families are encouraged to volunteer as a group and make it a special day together at the park for the picnic and field day. To volunteer, contact Laurie Clinton, Volunteer Program Manager, at 206-296-4452 or laurie.clinton@kingcounty.gov. No registration is necessary for the afternoon field day. Don’t want to wake up early, but still want to volunteer? 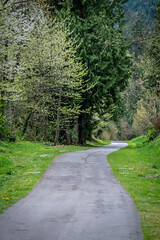 Stay at Tolt in a tent, RV, yurt, or even go “glamping” and try out our cargo-tainer!